Gene collected poems and jokes. Gene Autry Entertainment hears from fans on a regular basis that, "We love the Official Gene Autry Website and think it is great!" We also receive formal recognition and awards from the folks in the Website Award Industry. 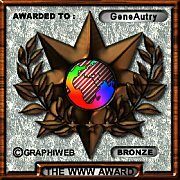 Listed below are the awards that www.geneautry.com has received thus far. We think Gene would approve!